A protocol for an ex vivo corneal organ culture model useful for wound healing studies is described. This model system can be used to assess the effects of agents to promote regenerative healing or drug toxicity in an organized 3D multicellular environment. Castro, N., Gillespie, S. R., Bernstein, A. M. Ex Vivo Corneal Organ Culture Model for Wound Healing Studies. J. Vis. Exp. (144), e58562, doi:10.3791/58562 (2019). The cornea has been used extensively as a model system to study wound healing. The ability to generate and utilize primary mammalian cells in two dimensional (2D) and three dimensional (3D) culture has generated a wealth of information not only about corneal biology but also about wound healing, myofibroblast biology, and scarring in general. The goal of the protocol is an assay system for quantifying myofibroblast development, which characterizes scarring. We demonstrate a corneal organ culture ex vivo model using pig eyes. In this anterior keratectomy wound, corneas still in the globe are wounded with a circular blade called a trephine. A plug of approximately 1/3 of the anterior cornea is removed including the epithelium, the basement membrane, and the anterior part of the stroma. After wounding, corneas are cut from the globe, mounted on a collagen/agar base, and cultured for two weeks in supplemented-serum free medium with stabilized vitamin C to augment cell proliferation and extracellular matrix secretion by resident fibroblasts. Activation of myofibroblasts in the anterior stroma is evident in the healed cornea. This model can be used to assay wound closure, the development of myofibroblasts and fibrotic markers, and for toxicology studies. In addition, the effects of small molecule inhibitors as well as lipid-mediated siRNA transfection for gene knockdown can be tested in this system. Scarring in the cornea resulting from injury, trauma, or infection can lead to debilitating opacities and permanent vision loss. Thus, there is a critical need to identify pathways that can be targeted for therapeutic intervention. Current treatment options are limited and consist primarily of corneal transplantations, which are not accessible to patients across the world. Both human (Figure 1) and animal corneas can be utilized for 2D and 3D cell culture studies1,2. Human cadaver corneas not suitable for transplant can be obtained from eye banks or centralized tissue banks (National Disease Research Interchange (NDRI)), and animal eyes can be obtained from an abattoir. Primary corneal epithelial cells, stromal fibroblasts, and more recently, endothelial cells, can be isolated and cultured from these tissues for wound healing and toxicology studies3,4,5. In addition to the importance of understanding the molecular basis of blinding eye disease, the accessibility of tissue and the ability to culture primary cells has made the cornea an important model system for study. The cornea is ideal for testing the effects of agents on scarring as the normal cornea is transparent and certain types of wounds create opacities or fibrotic scars (reviewed in6). Several in vivo corneal wound healing models have also been extensively utilized for scarring studies1. Less utilized has been the ex vivo corneal wound healing model7,8 that is describe in detail here. The goal of this method is to quantify scarring outcomes characterized by fibrotic makers in a 3D multicellular corneal ex vivo model system. Corneal epithelial wounding that does not breach the epithelial basement membrane normally closes within 24-72 h9. Soon after wounding, the cells at the edge of the epithelium start spreading and migrating into the epithelial free surface, to reestablish epithelial barrier function. This activity is sequentially followed by activation of corneal basal cell proliferation first and, in a later stage, of precursor cells located at the outer limbal zone to achieve recovery of epithelial cell mass10,11. These wounds often heal without scarring. However, a wound that penetrates the basement membrane into the stroma often results in scar formation1. After corneal stromal wounding, the stroma is populated with cells of multiple origins including differentiated resident stromal cells as well as bone marrow-derived fibrocytes12,13,14. Fibrotic scarring is characterized by the persistence of myofibroblasts in a healing wound. These pathological myofibroblasts demonstrate increased adhesion through the accumulation of integrins in focal adhesions, contractile α-smooth muscle actin (α-SMA) stress fibers, and local activation of extracellular matrix (ECM)-sequestered latent-transforming growth factor-beta (TGFβ). The differentiation of epithelial-derived cells, known as epithelial to mesenchymal transition (EMT), may also contribute to scar formation6. There is a delicate balance between cell differentiation and apoptosis after wounding. Because of the breach in the basement membrane, growth factors such as platelet-derived growth factor (PDGF) and TGFβ from tears and the epithelium bathe the stroma, inducing myofibroblast differentiation, a sustained autocrine loop of TGFβ activation, and the secretion of disorganized fibrotic ECM15,16. The persistence of myofibroblasts in the healed wound promotes haze and scarring in the cornea (Figure 2). However, in regeneratively healed wound although myofibroblasts develop, they apoptose and thus are absent or significantly reduced in number in the healed tissue (reviewed in reference6,10). Thus, research on fibrotic scarring has focused at least in part on targeting molecules that prevent excessive myofibroblast development or myofibroblast persistence17,18. Because myofibroblast persistence characterizes both scarring and fibrotic disease in all tissues19, the cornea may be useful as a model system to study general cellular mechanisms of fibrosis. In our model system, the cornea is wounded with a cylindrical blade called a trephine while still in the globe. Human and pig corneas can be wounded with either a 6 or 7 mm trephine; for rabbit corneas a 6 mm trephine is preferred. The pig cornea is similar in size to the human cornea. Because they are cost effective and readily available in large numbers, pig corneas are routinely used for organ culture. Furthermore, antibodies and siRNAs made to react with human have consistently cross-reacted with pig7. After wounding, corneas are cut from the globe with the limbus intact and mounted on an agar/collagen base. The corneas are cultured in serum-free media plus stabilized vitamin C to simulate fibroblast proliferation and ECM deposition20. Neither the addition of serum nor growth factors are needed to induce myofibroblast formation7. Corneas are routinely fixed and processed for histology after two weeks of culture. For gene knockdown, or to test the effects of an agent on wound healing, the wound can be treated with siRNA in the wound after wounding7 or a soluble agent can be added to the media, respectively8. Prepare agar solution as follows. In a small flask, prepare 1% agar and 1 mg/mL bovine collagen in DMEM-F12 up to 20 mL. Bring to boil on a hot plate. Put the solution into a 50 mL conical tube. Place tube in a water bath on a hot plate to keep the solution from solidifying. Prepare supplemented serum-free media (SSFM) as per the composition provided in the Table of Materials. NOTE: The necessary amount of SSFM to be prepared depends on the number of corneas to be processed. Usually 30 mL is enough media for 4 corneas. NOTE: Perform this step in a dissection hood or a chemical hood. The eyes are shipped with lids still attached in individual bags to protect the globes. Remove globes from lids with a straight-edge surgical blade on an ethanol-cleaned chopping board. Remove excess fatty tissue from the eye using either a blade or a small scissors (Figure 3A, 3B). After removing the globe from the lid, hold the globe posteriorly with forceps and immediately dip the eye in phosphate-buffered saline (PBS). Quickly dip it 3x in 10% iodine (in a 100 mL beaker). Quickly dip 2x in PBS (~100 mL in a beaker, change PBS frequently). Using a clean towel or tissue, wrap the eye circumferentially with enough pressure to have a taut corneal surface to cut with the trephine. NOTE: Take care to prevent the towel or tissue from contacting the cornea. Use a 6 mm trephine to wound the center of the cornea. Penetrate the epithelium and anterior stroma without making a full-thickness wound through the entire cornea. NOTE: If the endothelium is penetrated, a loss of pressure and leaking fluid will be seen. In this case the eye should be discarded. Place the trephine in the center of the cornea, rotate it 180° clockwise and counter-clockwise 5x (each time the direction is changed it will count as one time) while applying light pressure to deepen the wound. NOTE: The wound should now be deep enough to allow a tissue flap to be lifted using a pair of forceps. If this is not the case repeat step 1.3.2. Lift the flap from the edges. At the same time, either with the other hand or with a second person, use a blade, cutting parallel to the globe to cut away the tissue as the forceps continue to lift off the anterior cornea within the wound margin. At the conclusion of this step there should be a circular wound located at the center of the cornea (See Figure 3C, 3D). Holding the eye with the tissue, make a small incision 1 mm away from the edge of the cornea with a blade so that the limbus is included in the organ culture. Using small, sharp scissors access the incision created in the prior step to cut around the globe, keeping a millimeter margin throughout the cornea to keep the limbus intact. Place the cornea in a 60 mm dish with 1 mL of PBS, wound side down until mounting. Make sure the agar has come to a warm temperature (approximately 25 °C). With two pairs of forceps, create a cup by holding two sides of the cornea with the endothelial side up. Add the warmed-up agar solution into the cornea using a sterile transfer pipette until it is full. After the agar hardens (usually about 30-45 s) carefully flip the cornea with the agar into 60 mm plate (Figure 3E). Cover with a lid. Add 4 mL of SSFM to the plate, maintaining corneas at an air-liquid interface at the limbal border in 5% CO2 at 37 °C. Refresh media after 24 h and thereafter every other day. NOTE: If performing a transfection into the wound, omit the antibiotics until after transfection. Wet the corneal surface once daily by adding 1 drop of SSFM from the conditioned media in the dish to maintain moisture. For this, take the dish out of the incubator, place it under the hood, remove the dish lid, wet the surface with media from dish using a sterile pipette, cover again and put it back at the incubator. For gene knockdown, treat the wound with gene-targeting or control siRNA that is complexed to a lipid-mediated carrier as per the supplier's instructions (see below). Mix 5 µL (50 pmol) of siRNA into 50 µL of reduced-serum minimum essential media (e.g., Opti-MEM). Mix 2 µL of transfection reagent into 50 µL of reduced-serum media. Let this sit for 5 min and then mix them. Add 200 µL of reduced-serum minimum media to the reagent/siRNA mixture. Pipette dropwise onto the wound and incubate for 3 h.
Wash out siRNA from corneal surface with media in the dish.Change the incubation media to SSFM + antibiotics (see the Table of Materials). Continue incubation as mentioned previously (steps 1.6.1-1.6.2). After a two-week incubation, if using some of the tissue for quantitative real time polymerase chain reaction (qRT-PCR) analysis, before fixing, cut the cornea in half through the wound. Place this half or only ¼ (either is enough tissue) into stabilizing RNA-protect reagent. Using a standard isolation kit, isolate RNA and perform qRT-PCR. NOTE: Alternatively, the wounded part only can be isolated and tested for gene expression. Place the other half of the cornea into tissue pathology cassettes and submerge in fixative (10% formalin) for 2-4 days at room temperature (RT). Paraffin embed this half of the wounded cornea using standard techniques. NOTE: Orient the wounded cornea to ensure that the tissue sectioning will produce a cross-section of the cornea. Label slides properly using a pencil. De-paraffinize the tissue by placing slides into a jar with clearing agent (2 changes, 10 min each). Rehydrate the tissue by transferring the slides into ethanol at decreasing concentrations (100%, 100%, 70%, 50%, dH2O, dH20, 5 min for each change). Perform antigen retrieval by microwaving the slides in a plastic jar with citrate buffer (10 mM, pH 6.4) for 5 min. First cycle 5 min at 50% power. Refill the jar with citrate buffer and repeat. Cool down for 10 min. Wash 3x with PBS, 2 min each. Permeabilize tissue with 1% Triton X-100 in PBS 10 min at RT. Block sections with 3% normal goat serum (NGS) for 1 h at RT in humid chamber. Incubate tissue with primary antibody (1:100 or as the supplier suggests) in 3% NGS overnight at 4 °C (300 µL per slide). Rinse slides 3x with PBST (PBS plus 1% Tween 20), 2 min each. Place slides in 3% H2O2 for 10 min to block endogenous peroxidase. Wash 3x with PBST, 2 min each. Incubate sections with HRP secondary antibody (1:250) in 3% NGS for 1 h at RT (300 µL per slide). Wash slides 3x PBST, 2 min each. Treat slides with the DAB kit. Add 300 µL/slide for 3 min. Wash slides with dH2O 2x (quick dips). Counterstain with Hematoxylin for 20 s. Wash the slide with dH2O 2x (quick dips). Stain with bluing agent for 20 s. Rinse in dH2O for 20 s. Dehydrate tissue by placing slides into increasing concentrations of ethanol (50%, 70%, 100%, 100%, all quick dips). Dry slides on a paper towel under the hood for 10-20 min. Mount slides using 1 drop of mounting media, cover with coverslip. Label and store at RT. Image the slides under a microscope and quantify DAB signal with ImageJ7 (see section 4). On Day 1 follow steps described in step 2.2.1. Perform the following steps on Day 2. Rinse slides 3x in PBST for 2 min each. Incubate sections with fluorophore-tagged secondary antibody in 3% NGS (1:200) for 1 h at RT. Wash 3x in PBST, 2 min each. Mount slides using 1 drop of 4′,6-diamidino-2-phenylindole (DAPI) mounting media and cover with a coverslip. Dry on paper towel under the hood for 30 min. Store in the dark at 4 °C until fluorescence imaging. Download the "Fiji" version of ImageJ, which includes the necessary plugins for DAB staining quantification. Open an image in Fiji and select Image → Color → Color Deconvolution. Select "H DAB" as the stain and then click OK. Three new images will appear. Select the image that contains only DAB staining. To quantify stromal staining only, use the ImageJ eraser function to remove the epithelium from the DAB image. Select Analyze → Measure (or Ctrl + M) and record the value. Immunohistochemistry is the primary assay utilized to analyze the success of the ex vivo wound healing experiment. Figure 4 depicts the epithelium and anterior stroma in control tissue (Figure 4A, 4B). Six hours after wounding, the epithelium was absent (Figure 4C, 4D). Six days after wounding as expected, the epithelium had regrown (Figure 4E, 4F). This tissue was immunostained for alpha-smooth muscle actin (α-SMA), the expression of which characterizes myofibroblasts. There is a dramatic increase in α-SMA immunostaining in the stroma as detected by colorimetric DAB substrate. There was also an increase in epithelial reactivity that may suggest EMT transition7 (see the Discussion). Disorganization in the epithelium and stroma was evident. A wounding experiment at lower magnification and with fluorescent immunostaining instead of DAB is shown (Figure 4G, 4H). The wound margin is visible as well as a gradient of active myofibroblasts from the anterior to posterior stroma. Although fibrotic markers are expressed by one week (Figure 4), to obtain consistent and reliable development of fibrotic markers, a two-week time point was chosen. In Figure 5 an assay using a one-time application of control or gene-targeting siRNA to be tested for promoting regenerative healing is demonstrated. In this case, the targeting siRNA was for USP10, a deubiquitinase. Pathological myofibroblasts demonstrated increased adhesion through the accumulation of αv-integrins in focal adhesions21. Our previous studies showed that αvβ1 and αvβ5 are important fibrotic integrins in corneal stromal healing7. Integrins bind ECM outside the cell and together they are internalized. The internalized integrin is ubiquitinated and sent for degradation in the lysosome or the ubiquitin tag is removed by a deubiquitinase (DUB) and the integrin is recycled to the cell surface. We discovered that an increase in the gene expression of the DUB (USP10) increased the rate of ubiquitin removal from the integrin subunits β1 and β5 leading to a resultant accumulation of αv/β1/β5, on the cell surface, with subsequent TGFβ activation and induction of fibrotic markers7. Knockdown of USP10 in corneal organ culture prevented the appearance of fibrotic markers7. An example of these results is shown in Figure 5. As above, α-SMA is utilized as a marker for myofibroblasts. Another indicator of scarring is Fibronectin-EDA (FN-EDA), a splice variant of FN that contains an RGD, αv integrin binding domain22,23,24. It is also termed cellular FN (c-FN). It serves as a key fibrotic marker since FN-EDA is not in circulating plasma but instead is only expressed and secreted by cells under fibrotic conditions25. In Figure 5A-5C immunostaining for α-SMA is shown. Compared to unwounded (Figure 5A), wounding plus control siRNA (Figure 5B) showed a dramatic increase in α-SMA protein expression, whereas addition of USP10 siRNA7 dramatically reduced expression in the stroma and epithelium. 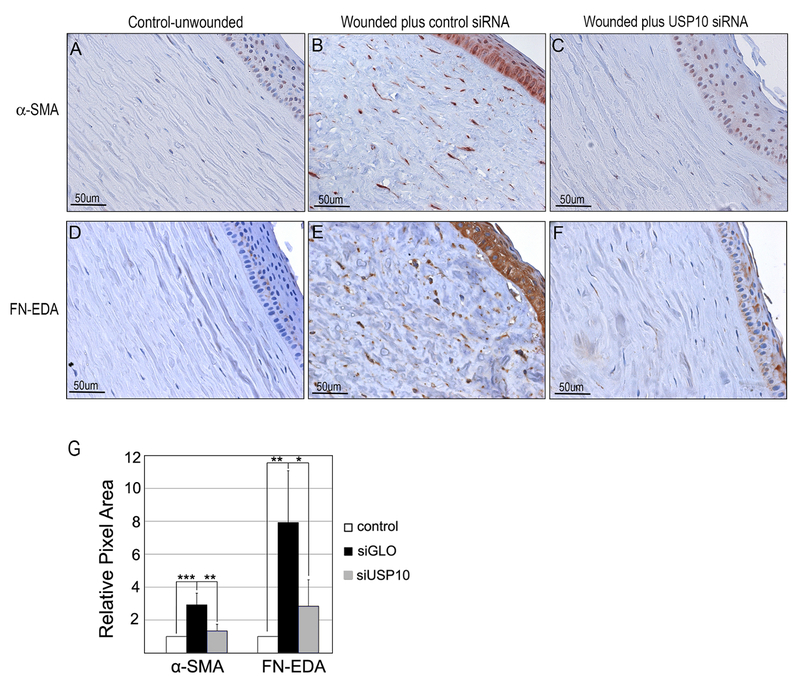 Similarly, compared to unwounded (Figure 5D), wounding plus control siRNA (Figure 5E) demonstrated a dramatic increase in fibronectin-EDA protein expression compared to treatment with USP10 siRNA (Figure 5F). Immunohistology for the target protein (in this case, USP10) was used to demonstrate successful knockdown7. In addition, performing qRT-PCR can assure gene knockdown in the tissue or also to assay for other fibrotic markers7. ImageJ can be used to quantify signal in the stroma only or total signal (Figure 5G). At least 3 corneas for each condition being tested should be used to quantify immunostaining to generate statistical significance as we have shown here and previously published7. Other proteins that have been routinely utilized for fibrotic markers are collagen III expression and an increase in integrin expression1,26. In Figure 6, the use of ex vivo cornea culture is demonstrated as a toxicology assay. In this experiment, corneas were either left unwounded (Figure 6A), wounded (Figure 6B), or wounded and treated with 10 µM Spautin-127, which was added to the cell culture media for increasing periods of time before wash out (Figure 6C-6F). Spautin-1 is a drug that non-specifically targets USP1027. Because of our success with USP10 siRNA, Spautin treatment was tested for effectiveness in preventing scarring. Unlike the siRNA, Spautin at this concentration was toxic to the tissue. Increasing time with Spautin-1 in culture prevented re-epithelialization and resulted in qualitative cell death, disorganized matrix and stromal vacuoles suggesting that Spautin-1 does not promote healing at the concentration assayed. Standard histological assays can be employed to quantify cell proliferation or apoptosis. Figure 1: Cross-section of a human eye with an expanded view of the cornea. In primates and chickens, histologically there are five distinct layers: epithelium, Bowman's membrane, stroma, Decement's membrane, and endothelium28,29. In all other mammals, Bowman's membrane is not visible histologically. 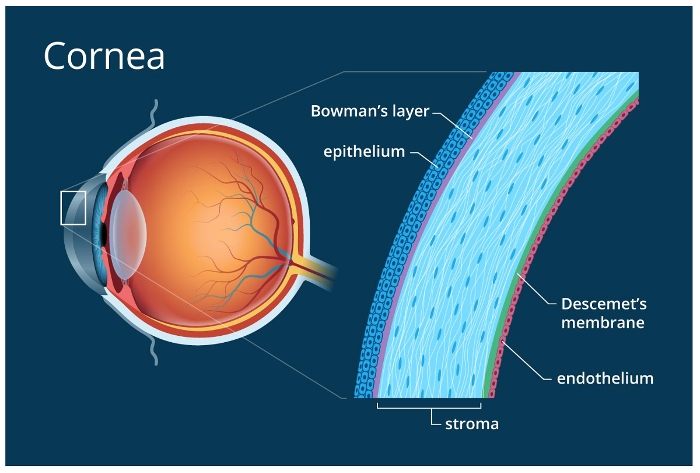 At the transmission electron microscopic level, a basement membrane is observed separating the corneal epithelium and stroma in all corneas including those with a Bowman's membrane. An intact Bowman's membrane or basement membrane separating the epithelium from the stroma is a necessary to prevent scarring in all mammals. Image reprinted with permission from AllAboutVision.com (http://www.allaboutvision.com/resources/cornea.htm). Please click here to view a larger version of this figure. Figure 2: Diagram of the cellular events that lead to corneal scarring. 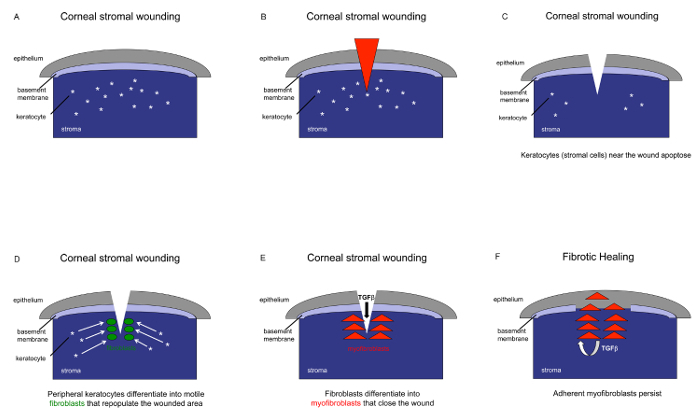 This diagram depicts the basic events that unfold in the anterior cornea after wounding. (A) Depiction of the epithelium, basement membrane, stroma, and the quiescent cells embedded in the stroma, i.e, keratocytes. (B) The red triangle depicts a wound, which can be mechanical, an ulcer, virus, or persistent infection. (C) After wounding, in which the Bowman's or basement membrane is breached, the cells around the wound apoptose. (D and E) An influx of cells repopulate the wound from resident keratocytes or bone marrow-derived fibroblasts and transition into activated fibroblasts or directly into myofibroblasts. (F) These adherent pathological myofibroblasts create an autocrine loop of TGFβ activation and secretion of disorganized fibrotic matrix that promotes corneal haze and scar formation. In a regeneratively healed wound, myofibroblasts appear but have apoptosed in the healed tissue6,29,30. Please click here to view a larger version of this figure. Figure 3: Receiving and processing corneas for organ culture. (A) Pig eyes are received with lids to protect the cornea during shipping. (B) Image of the globe after tissue is removed. (C) Image of a 6 mm trephine. (D) Wounding of the central cornea with a trephine. (E) Image of the mounted cornea after removal from the globe. Please click here to view a larger version of this figure. Figure 4: Corneal tissue after wounding. Immunohistological analysis of unwounded (control) or wounded corneas. Pig corneas were either left unwounded (control) or wounded. 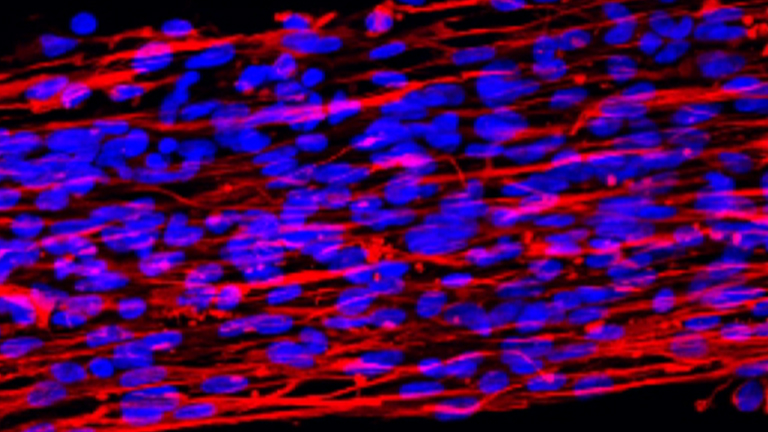 Tissue sections were immunostained with antibody to alpha-smooth muscle actin (α-SMA) to identify myofibroblasts. (A and B) Control, unwounded. (C and D) Wounded and fixed at 6 h post-wounding. Epithelium is removed (arrow). (E and F) Wounded and fixed at 6 days post-wounding. Stroma has filled-in and the epithelium has regrown (arrow head). Representative activated myofibroblasts are denoted with asterisks (*). (G, H) Low magnification images of α-SMA immunostaining 2 weeks after wounding: α-SMA (red), DAPI (blue). Images were captured using an upright fluorescence/brightfield microscope with a CCD camera. Scale bar = 100 µm (A, C, E); 50 µm (B, D, F); 200 µm (G, H). Please click here to view a larger version of this figure. Figure 5. Testing regenerative healing agents. Pig corneas were either (A and D) unwounded (control), (B and E) wounded and treated with control siRNA, or (C and F) wounded and treated with USP10 siRNA. Immunostaining for (A-C) α-SMA or (D-F) Fibronectin-EDA. After treatment with USP10 siRNA, α-SMA was reduced by 2.2 ± 0.6 fold ***p < 0.001 and FN-EDA 3.3 ± 1.2 fold **p < 0.01. Images were captured using an upright fluorescence/brightfield microscope with a CCD camera. Scale bar = 50 µm. (G) Corneal stromal staining as quantified by ImageJ. Statistical significance was calculated by one-way ANOVA with Bonferroni's test. Figure has been adapted with permission from Gillespie et al.7. Please click here to view a larger version of this figure. Figure 6: Testing agents for effects on reepithelialization - toxicology studies. Immunostaining for α-SMA. Pig corneas were (A) unwounded, and (B) wounded. (C-F) Cornea were wounded and incubated with 10 µM Spautin-1. The inhibitor was washed out and replaced by media after (C) 2 days, (D) 4 days, (E) 6 days, (F) 14 days. All media changes during the incubation period included Spautin as indicated. All corneas were fixed and embedded in paraffin after 2 weeks in culture. Images were captured using an upright fluorescence/brightfield microscope with a CCD camera. Scale bar = 50 µm. Please click here to view a larger version of this figure. This protocol describes a model for studying wound healing in a natural stratified 3D environment. Use of organ culture as an intermediate between cell culture and in vivo studies significantly reduces costs as well as reducing procedures on live animals. Other 3D models have been of great benefit to the field including self-synthesizing collagen gels made from primary human corneal fibroblasts2 or these same cells embedded in gels made from animal-derived collagens31. The organ culture model system is particularly useful for testing putative healing agents since the wound is localized and thus there is a clear margin between wounded and non-wounded tissue in the same cornea (Figure 4). In addition, a mechanical trephine wound allows direct access to the stroma, which is excellent for administration of siRNAs into the wound (Figure 5). Although it is not shown here, viral transduction into corneal tissue in organ culture has also been demonstrated32,33,34. Another permutation of this assay would be to infect corneas with a reporter construct of interest and image gene expression in real time after wounding. In terms of translation to in vivo studies, this same procedure can be accomplished in rabbits35 and thus organ culture on human, pig, or rabbit corneas can be compared to in vivo results. In our experience, the data that we obtained using the organ culture model with siRNA treatment have translated into similar findings in vivo (unpublished data). Since the organ culture corneas lack a functional limbal vasculature, tears, and aqueous humor, each investigator must assess if this will be a useful model for their studies. Resident activation of immune cells has been demonstrated, but the exact parallel to in vivo studies is not yet clear1. A key step in the protocol is not to penetrate the cornea by wounding too deeply. This will be obvious as the anterior chamber fluid will leak in this case. If this occurs, the globe should be discarded. To produce an even mechanical wound, grip the lip of the demarcated tissue within the trephined area with a forcep and then move the surgical blade parallel to the corneal surface to cut the tissue away within the boundaries of the trephine wound. The corneal surface should not dry out thus we recommend that after making the wound and cutting out the cornea from the globe, place the cornea face down in PBS until the agar mixture is at the correct temperature. Making sure that the agar is not too hot will avoid endothelial damage. A limitation of this model is that the use of a trephine to produce a wound is uneven and cannot be reproduced identically from cornea to cornea compared to laser-induced wounds36. However, naturally occurring wounds are not all equivalent in depth and a large body of data suggest that any breach in the basement membrane generates myofibroblast development and haze in the stroma, whereas regeneration of the basement membrane leads to diminished scarring37,38,39. This pig corneal organ culture model employs a severe wound in which the basement membrane is removed within the area of the trephine. Development of myofibroblasts and fibrotic markers in the corneal stroma have been consistently and reproducibility achieved using this model system. Some epithelial staining is usually evident that darkens in the wounded and regrown epithelium. This has been demonstrated in other corneal organ culture reports40 but is absent in most corneas from in vivo mouse and rabbit studies41,42. However, a study performed in an in vivo canine model demonstrated strong epithelial α-SMA staining in the epithelium after wounding43. The siRNA that promoted regenerative healing in our studies also significantly reduced this epithelial immunostaining, suggesting that the epithelium may be undergoing EMT (fibrotic scarring) when it regrows in organ culture. In addition, omission of a primary antibody in the staining protocol of a wounded cornea resulted in the total absence of staining7 suggesting that the immunostaining is specific. Frozen sections (not shown) were similar to paraffin sections in this regard. However, because the slight but variable background staining in the epithelium, our lab has only quantified the stromal staining, which appears to have no background histological issues7. If wounding human corneas, obtaining corneas not used for transplant instead of full globes may be more cost effective40. In this case, the cornea will be wounded without the aid of the pressure afforded by the globe. Additional wounding strategies may include corneal burns, which have been extensively utilized in vivo to produce a scar42. In summary, the advantages of this system for a 3D tissue wound healing assay is its reproducibility and cost savings with only standard equipment needs, making it an excellent resource for observing and quantifying the effects of agents on tissue healing. This work was supported by NIH-NEI R01 EY024942, Research to Prevent Blindness, Upstate Medical University Unrestricted Research Funds, and Lions District 20-Y. Microscopy and image analysis of paraffin sections were performed at the Microscopy CORE and histological slide preparation was performed at the Biorepository and Pathology CORE at the Icahn School of Medicine at Mount Sinai. Supplemented Serum- Free media (SSFM) Add all of the following components to DMEM/F-12: ITS, RPMI, Glutathione, L-Glutamine, MEM Non essential amino acids, MEM Sodium Pyruvate, ABAM, Gentamicin, Vitamin C.
Glutathione Sigma G6013 Use at 1 µg/mL. Freeze aliquots; do not reuse after thawing. MEM Sodium pyruvate solution Gibco 11360 1 M Stocks (1,000x) and freeze in single use aliquits. Use from freezer each time media is made. Moist Chamber Use any chamber, cover it with wet Wipe Tissue and then put a layer of Parafilm over it. Stepp, M. A., et al. Wounding the cornea to learn how it heals. Experimental Eye Research. 121C, 178-193 (2014). Karamichos, D., Hutcheon, A. E., Zieske, J. D. Transforming growth factor-beta3 regulates assembly of a non-fibrotic matrix in a 3D corneal model. Journal of Tissue Engineering and Regenerative Medicine. 5, (8), e228-e238 (2011). Ronkko, S., Vellonen, K. S., Jarvinen, K., Toropainen, E., Urtti, A. Human corneal cell culture models for drug toxicity studies. Drug Delivery and Translational Research. 6, (6), 660-675 (2016). Bernstein, A. M., Twining, S. S., Warejcka, D. J., Tall, E., Masur, S. K. Urokinase receptor cleavage: a crucial step in fibroblast-to-myofibroblast differentiation. Molecular Biology of the Cell. 18, (7), 2716-2727 (2007). Zhu, Y. T., et al. Knockdown of both p120 catenin and Kaiso promotes expansion of human corneal endothelial monolayers via RhoA-ROCK-noncanonical BMP-NFkappaB pathway. Investigative Ophthalmology & Visual Science. 55, (3), 1509-1518 (2014). Shu, D. Y., Lovicu, F. J. Myofibroblast transdifferentiation: The dark force in ocular wound healing and fibrosis. Progress in Retinal and Eye Research. 60, 44-65 (2017). Gillespie, S. R., Tedesco, L. J., Wang, L., Bernstein, A. M. The deubiquitylase USP10 regulates integrin beta1 and beta5 and fibrotic wound healing. Journal of Cell Science. 130, (20), 3481-3495 (2017). Yang, Y., et al. TRPV1 potentiates TGFbeta-induction of corneal myofibroblast development through an oxidative stress-mediated p38-SMAD2 signaling loop. PLoS One. 8, (10), e77300 (2013). Sta Iglesia, D. D., Stepp, M. A. Disruption of the basement membrane after corneal debridement. Investigative Ophthalmology & Visual Science. 41, (5), 1045-1053 (2000). Ljubimov, A. V., Saghizadeh, M. Progress in corneal wound healing. Progress in Retinal and Eye Research. 49, 17-45 (2015). Echevarria, T. J., Di Girolamo, N. Tissue-regenerating, vision-restoring corneal epithelial stem cells. Stem Cell Reviews and Reports. 7, (2), 256-268 (2011). Wilson, S. E., Mohan, R. R., Hong, J. W., Lee, J. S., Choi, R. The wound healing response after laser in situ keratomileusis and photorefractive keratectomy: elusive control of biological variability and effect on custom laser vision correction. Archives of Ophthalmology. 119, (6), 889-896 (2001). Zieske, J. D., Guimaraes, S. R., Hutcheon, A. E. Kinetics of keratocyte proliferation in response to epithelial debridement. Experimental Eye Research. 72, (1), 33-39 (2001). Lassance, L., Marino, G. K., Medeiros, C. S., Thangavadivel, S., Wilson, S. E. Fibrocyte migration, differentiation and apoptosis during the corneal wound healing response to injury. Experimental Eye Research. 170, 177-187 (2018). Jester, J. V., Ho-Chang, J. Modulation of cultured corneal keratocyte phenotype by growth factors/cytokines control in vitro contractility and extracellular matrix contraction. Experimental Eye Research. 77, (5), 581-592 (2003). Gallego-Munoz, P., et al. Effects of TGFbeta1, PDGF-BB, and bFGF, on human corneal fibroblasts proliferation and differentiation during stromal repair. Cytokine. 96, 94-101 (2017). Hinz, B., Gabbiani, G. Fibrosis: recent advances in myofibroblast biology and new therapeutic perspectives. F1000 Biology Reports. 2, 78 (2010). Lagares, D., et al. Targeted apoptosis of myofibroblasts with the BH3 mimetic ABT-263 reverses established fibrosis. Science Translational Medicine. 9, (420), (2017). Hinz, B. Formation and function of the myofibroblast during tissue repair. Journal of Investigative Dermatology. 127, (3), 526-537 (2007). Karamichos, D., Guo, X. Q., Hutcheon, A. E., Zieske, J. D. Human corneal fibrosis: an in vitro model. Investigative Ophthalmology & Visual Science. 51, (3), 1382-1388 (2010). Henderson, N. C., et al. Targeting of alphav integrin identifies a core molecular pathway that regulates fibrosis in several organs. Nature Medicine. 19, (12), 1617-1624 (2013). Muro, A. F., et al. An essential role for fibronectin extra type III domain A in pulmonary fibrosis. American Journal of Respiratory and Critical Care Medicine. 177, (6), 638-645 (2008). Shinde, A. V., et al. The alpha4beta1 integrin and the EDA domain of fibronectin regulate a profibrotic phenotype in dermal fibroblasts. Matrix Biology. 41, 26-35 (2014). White, E. S., Muro, A. F. Fibronectin splice variants: understanding their multiple roles in health and disease using engineered mouse models. IUBMB Life. 63, (7), 538-546 (2011). Walraven, M., Hinz, B. Therapeutic approaches to control tissue repair and fibrosis: Extracellular matrix as a game changer. Matrix Biology. (2018). Rosenbloom, J., Ren, S., Macarak, E. New frontiers in fibrotic disease therapies: The focus of the Joan and Joel Rosenbloom Center for Fibrotic Diseases at Thomas Jefferson University. Matrix Biology. 51, 14-25 (2016). Liu, J., et al. Beclin1 controls the levels of p53 by regulating the deubiquitination activity of USP10 and USP13. Cell. 147, (1), 223-234 (2011). Ritchey, E. R., Code, K., Zelinka, C. P., Scott, M. A., Fischer, A. J. 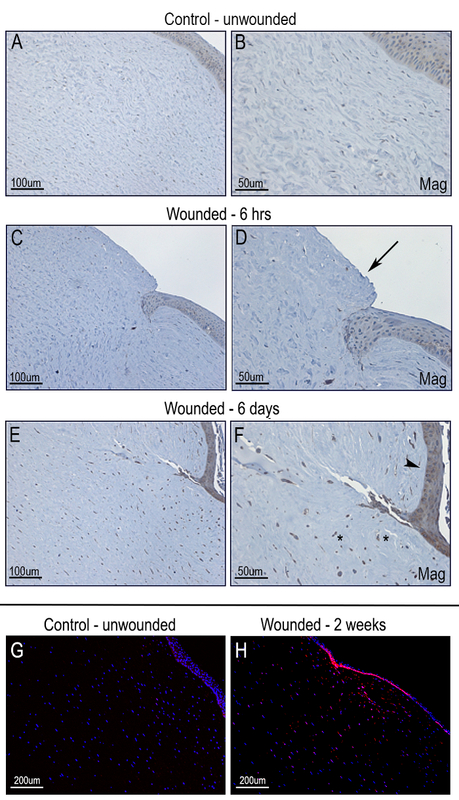 The chicken cornea as a model of wound healing and neuronal re-innervation. Molecular Vision. 17, 2440-2454 (2011). DelMonte, D. W., Kim, T. Anatomy and physiology of the cornea. Journal of Cataract & Refractive Surgery. 37, (3), 588-598 (2011). Wilson, S. E., et al. Epithelial injury induces keratocyte apoptosis: hypothesized role for the interleukin-1 system in the modulation of corneal tissue organization and wound healing. Experimental Eye Research. 62, (4), 325-327 (1996). Miron-Mendoza, M., Graham, E., Kivanany, P., Quiring, J., Petroll, W. M. The Role of Thrombin and Cell Contractility in Regulating Clustering and Collective Migration of Corneal Fibroblasts in Different ECM Environments. Investigative Ophthalmology & Visual Science. 56, (3), 2079-2090 (2015). Saghizadeh, M., et al. Adenovirus-driven overexpression of proteinases in organ-cultured normal human corneas leads to diabetic-like changes. Brain Research Bulletin. 81, (2-3), 262-272 (2010). Saghizadeh, M., Kramerov, A. A., Yu, F. S., Castro, M. G., Ljubimov, A. V. Normalization of wound healing and diabetic markers in organ cultured human diabetic corneas by adenoviral delivery of c-Met gene. Investigative Ophthalmology & Visual Science. 51, (4), 1970-1980 (2010). Kramerov, A. A., Saghizadeh, M., Ljubimov, A. V. Adenoviral Gene Therapy for Diabetic Keratopathy: Effects on Wound Healing and Stem Cell Marker Expression in Human Organ-cultured Corneas and Limbal Epithelial Cells. Journal of Visualized Experiments. (110), e54058 (2016). Cho, S. Y., Kim, M. S., Oh, S. J., Chung, S. K. Comparison of synthetic glues and 10-0 nylon in rabbit lamellar keratoplasty. Cornea. 32, (9), 1265-1268 (2013). Sharma, A., Mehan, M. M., Sinha, S., Cowden, J. W., Mohan, R. R. Trichostatin a inhibits corneal haze in vitro and in vivo. Investigative Ophthalmology & Visual Science. 50, (6), 2695-2701 (2009). Marino, G. K., Santhiago, M. R., Torricelli, A. A., Santhanam, A., Wilson, S. E. Corneal Molecular and Cellular Biology for the Refractive Surgeon: The Critical Role of the Epithelial Basement Membrane. Journal of Refractive Surgery. 32, (2), 118-125 (2016). Marino, G. K., Santhiago, M. R., Santhanam, A., Torricelli, A. A. M., Wilson, S. E. Regeneration of Defective Epithelial Basement Membrane and Restoration of Corneal Transparency After Photorefractive Keratectomy. Journal of Refractive Surgery. 33, (5), 337-346 (2017). Marino, G. K., et al. Epithelial basement membrane injury and regeneration modulates corneal fibrosis after pseudomonas corneal ulcers in rabbits. Experimental Eye Research. 161, 101-105 (2017). Janin-Manificat, H., et al. Development of ex vivo organ culture models to mimic human corneal scarring. Molecular Vision. 18, 2896-2908 (2012). Mohan, R. R., et al. Apoptosis, necrosis, proliferation, and myofibroblast generation in the stroma following LASIK and PRK. Experimental Eye Research. 76, (1), 71-87 (2003). Anumanthan, G., et al. KCa3.1 ion channel: A novel therapeutic target for corneal fibrosis. PLoS One. 13, (3), e0192145 (2018). Chandler, H. L., Colitz, C. M., Lu, P., Saville, W. J., Kusewitt, D. F. The role of the slug transcription factor in cell migration during corneal re-epithelialization in the dog. Experimental Eye Research. 84, (3), 400-411 (2007).